Hi there! Last week I was the Featured Facebook Fan on Card Positioning Systems. YAY! You can find sketch 175 right HERE, which is the sketch I was assigned to work with. I REALLY struggled with the grid pattern on the background, but thought of a fun and different way to incorporate that into my card: a glitter grid! To do that, I used sticky sheets, and cut the mat into 9 symmetrical sections (with a type A stamper, it's all about symmetry you know? LOL). Then, I removed one section of the layer at a time and glittered all outer sections with a different color of glitter (which is no problem when you have TONS of glitter like I do LMBO). I used the Pure Innocence stamp set, Make Mine a Double for this card. I wanted to use sweet little girl colors, so I grabbed my Basic Grey Kioshi. Little know fact: I hardly EVER use purple. I just don't... I added glitter to her hair barrette and the heart on her dress. I added 2 mm Swarovski crystals to the buckles of her shoes. I made a flat, folded, paper bow thingy and added a 3 mm Swarovski crystal to the center of the center. Question of the Day: What is your favorite brand/flavor of ice cream? 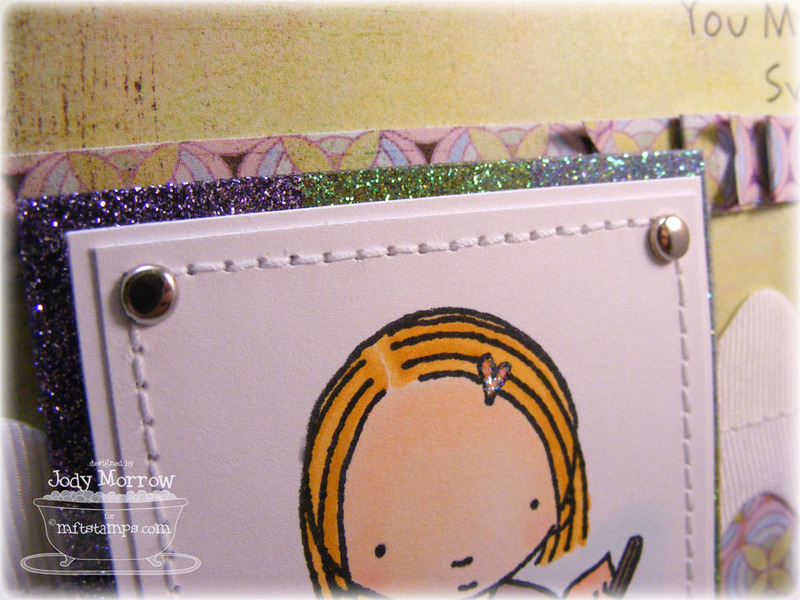 Love all the special little details of this card; and I really like your paper bow! Fav ice cream? Mint chocolate chip. Cute card; LOVE the gems on her shoes - too, too cute. I adore that little paper bow you made with the crystal in the center-so sweet! Ooo...I see the mention of Phish Food, that is GOOD stuff!! 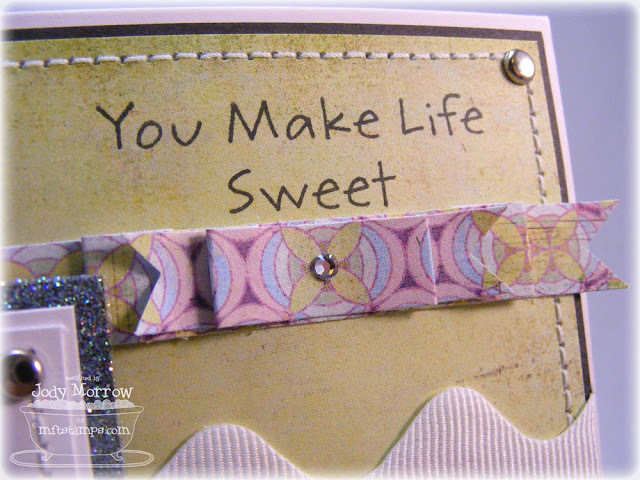 I adore this card and omigosh, that DP is SWEET! Love the bow - glad you included the close-up pic - TFS! As for fav ice cream, it depends on the mood - and lately I'm lovin' Breyers' black raspberry chocolate! totally adorable & awesome glitter and bow! my daughter & i love Baskin Robbins mint choco chip-yum! She is so ADORABLE Jody, I love all your wonderful details. LOVE that glitter border -- just wish I could see MORE of it! Glittery squares are right up my alley! Ummm, ice cream? I love Coffee flavored ice cream. No particular favorite brand. Haagen Daz is good. Locally, I really like Braum's ice cream, too -- last few times I've been there, I've been on a Mint Chocolate Chip kick. I also love Buttered Pecan, Neopolitan, and good ol' orange sherbet! Mmmmm... now I want some -- of ALL of those! Have you ever tried Blue Bell's sundae ice cream or the birthday cake flavor? YUM! Okay. Now I have to get back to studying with ice cream on the brain!!! The card is darling Jody! Mine is Maple Walnut, LOVE IT...sometimes Tiger. My daughter loves Phish Food by Ben & Jerry and we can't get it here but she just got home from San Diego with her Dad and she said she had one a day down there!!!! So totally cute Jody!! I love it!! Fave ice cream: Has to be Butter Pecan or Chocolate Chip...toss up! !